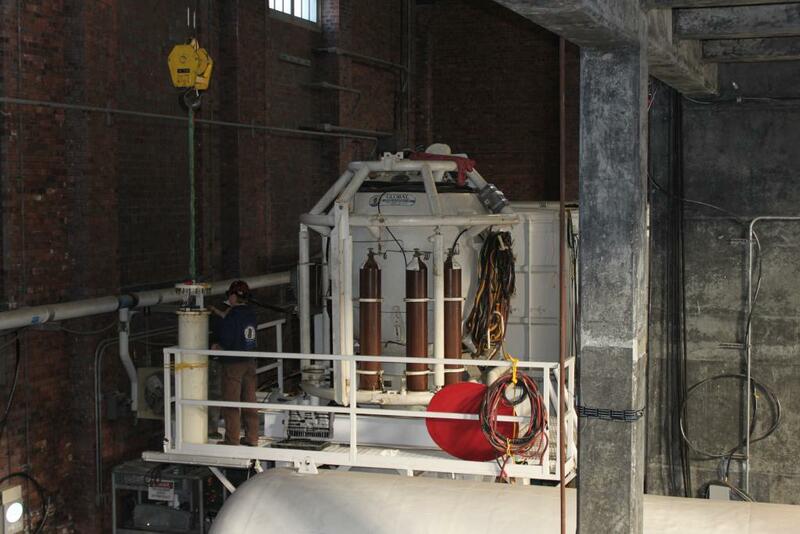 New York Water Supply - Global Diving & Salvage, Inc. Global was contracted by Roundout Constructors to perform detailed inspection and measurements of an existing horizontal drift and submarine door, removal of existing plumbing components, and the removal and replacement of a 24-inch gate valve encased in concrete. The work was performed in an access shaft of the Delaware Aqueduct system, owned and operated by New York City’s Department of Environmental Protection. The drift and valve are located in approximately 685 feet of water at the bottom of an 13-foot diameter shaft, north of New York City. 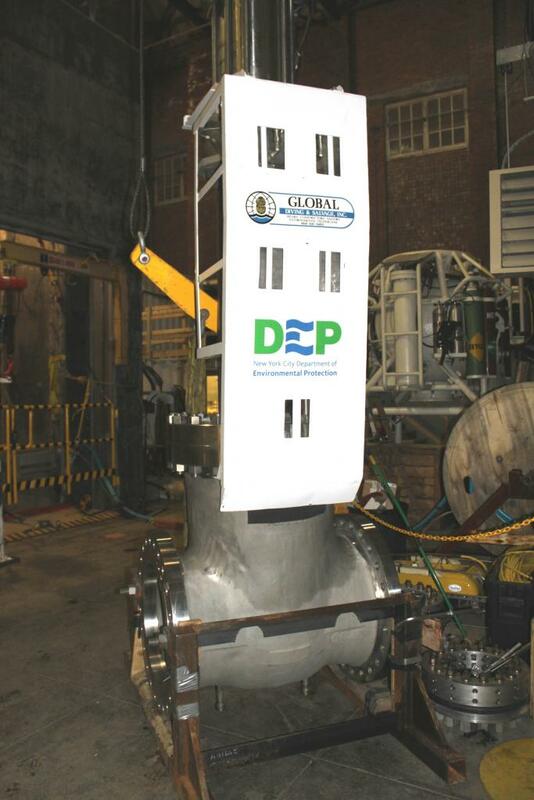 The purpose of the project was to inspect and verify the condition of the drift and submarine door, remove several pieces of plumbing and replace a valve to allow dewatering of the system. Prior to start of the project on-site, all aspects of the project had to be performed in a full-scale mock-up to demonstrate the methodology and constructability of the work plan; because of the site’s limited access and allowable work timeline there was little room for any delay in the project. 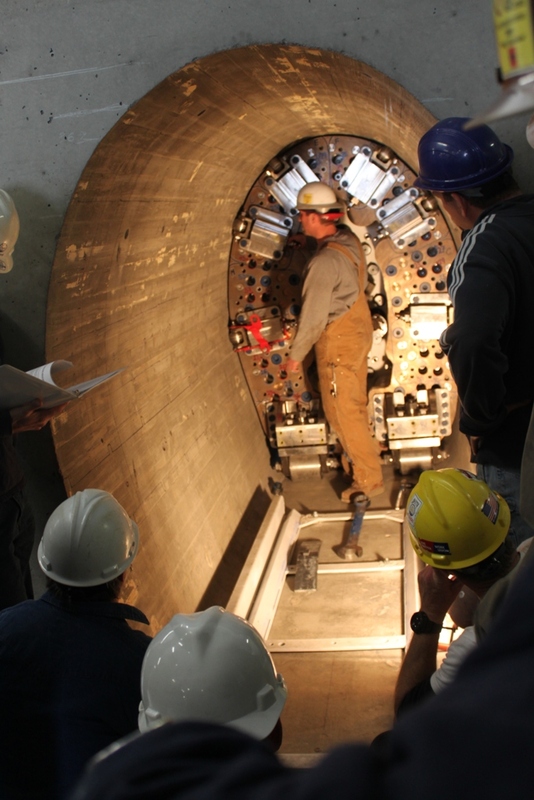 Full-size mock-ups were designed and built addressing the salient points of the project; specialized tooling had to be designed and work plans drawn up to get to the work location. All tools, equipment and personnel had to be able to access the site via a 13-foot diameter shaft. To complicate matters, the top of the shaft was enclosed by a concrete structure with doors on opposing sides, 10-feet wide by 15-feet high, that further limited access. Global designed and built all of the mock-ups, specialized tooling and equipment at our Seattle headquarters. The mock-up demonstrations were carried out at a local shipyard in shallow water. Access to the shaft and drift required the specialized design of components and rigging to move tooling into place; a track system was designed to allow for adjustment in both the X and Y axis, providing a consistent, repeatable point that could be moved in and out of the drift. A fast-scanning sonar head was mounted to a purpose-built cart; combined with tactile measurements, the team achieved accurate measurements of the 70 feet long drift to within +/- 1/8”. 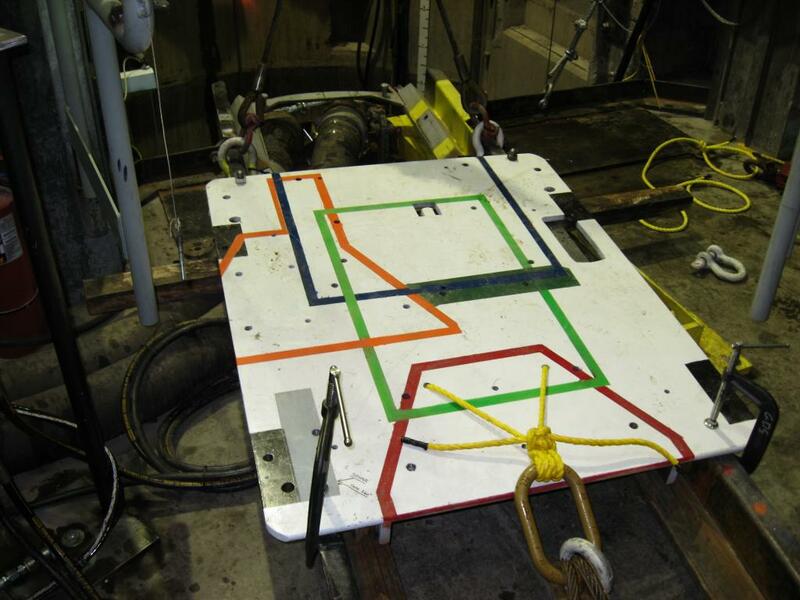 The track system and cart were also designed to accommodate the core drill base so sample cores could be taken at any radial location along the drift. 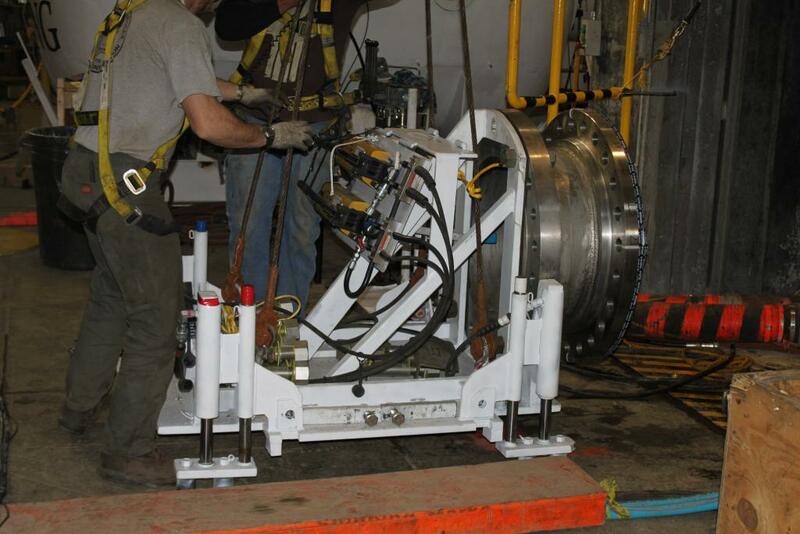 Working at 685 feet of water required the use of saturation diving. 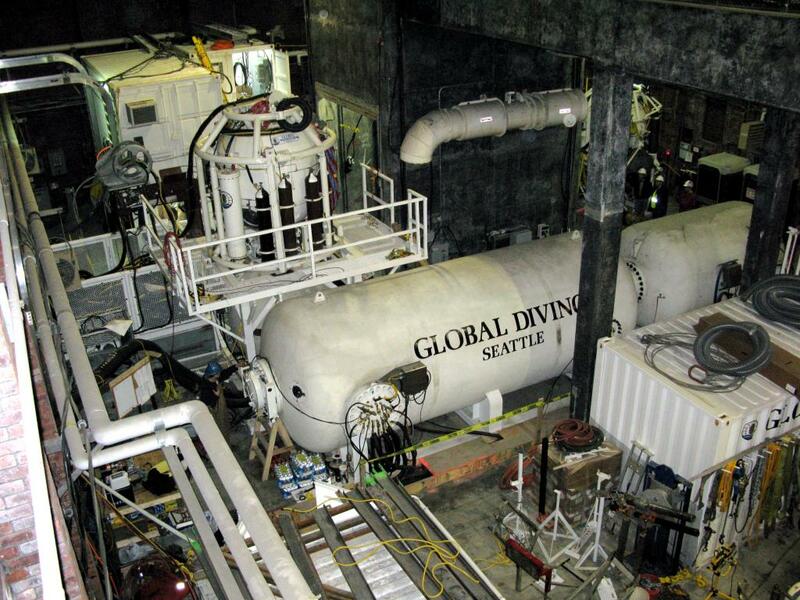 The complete system, set up to accommodate six divers, was moved into the building that housed the shaft. The system was equipped with re-breathers, enabling the reuse of the helium component of the breathing gas mixtures. 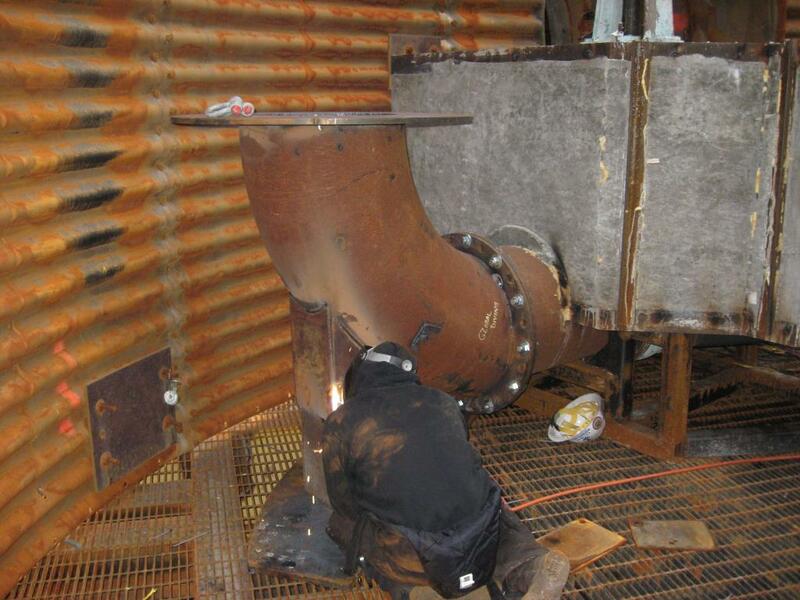 Sections of the existing 24-inch manganese bronze piping were removed including elbows, tees and needle valves. 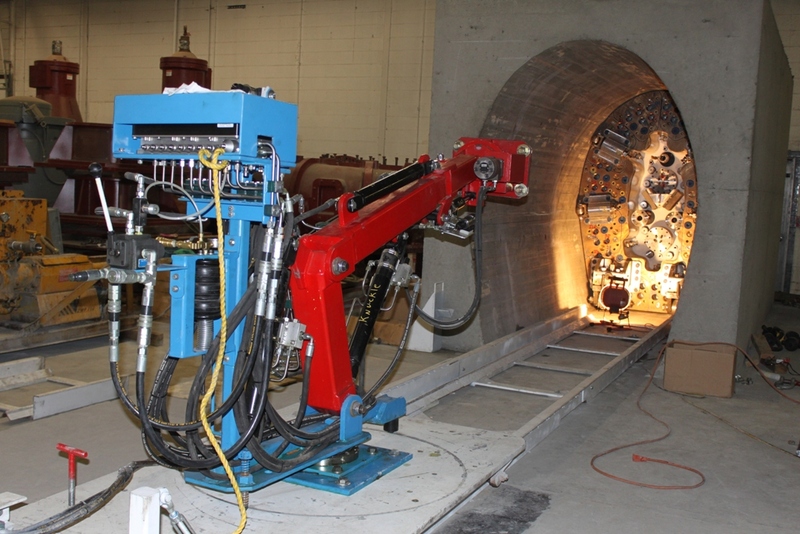 The piping was cut using a remotely operated rotary mill. Approximately 25,000 pounds of piping was removed. A 24-inch gate valve, encased in concrete above the valve bonnet was completely exposed using a combination of hydraulic splitting and ultra high pressure water blasting to remove approximately 7 cubic yards of concrete. A detailed plan of the hole spacing and splitting sequence had already been performed on a mock-up at our Seattle headquarters to ensure there would be no stress on the active valve during the concrete removal. 1 ¾” holes were cored over 6-feet deep to accept the hydraulic splitters. 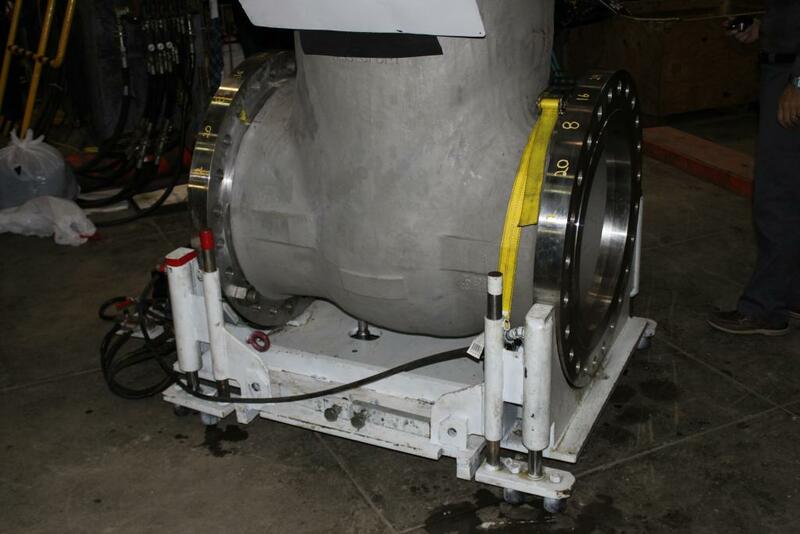 The valve was exposed and removed, and the dive team completed installation of the new hydraulically operated valve. 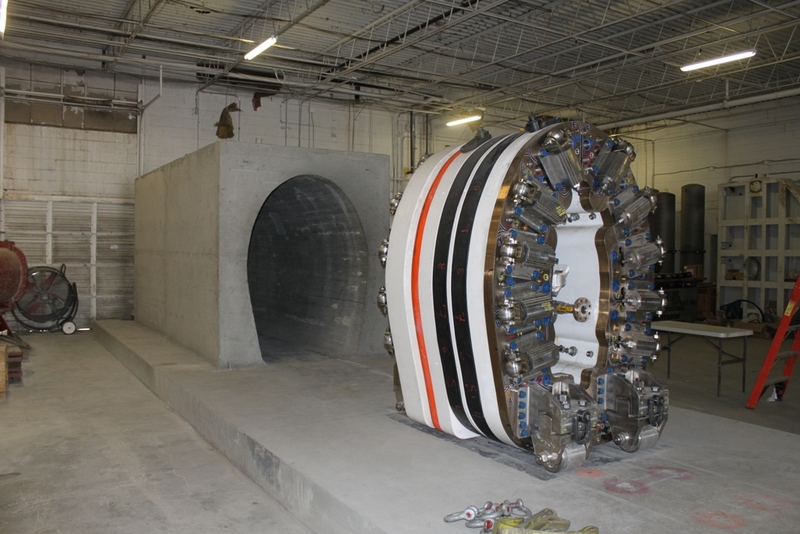 In preparation for the upcoming bypass tunnel installation, Global was contracted to install a mechanical plug to isolate the dewatering shaft from the aqueduct. At the bottom of the shaft is a horizontal drift that was used for access during the original construction. The drift has a bronze hemispherical submarine door that can be closed to isolate the aqueduct from the shaft. 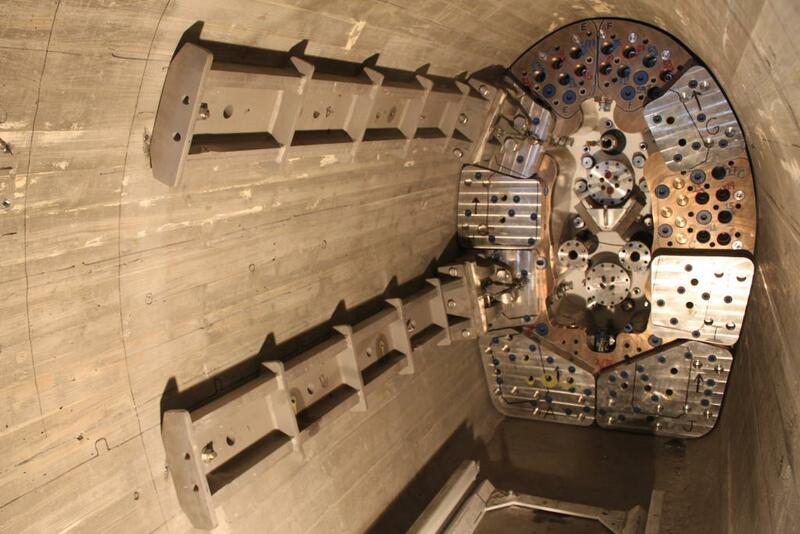 Depending on the demand, this door can see up to 1,100 feet of head pressure. 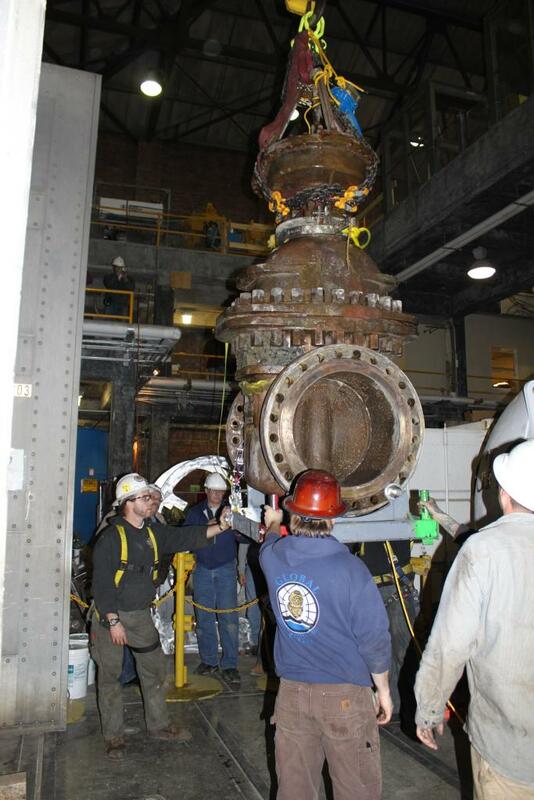 To install the pumps and plumbing required to support the bypass operation, the shaft needed to be dewatered. To provide an added safety measure, saturation divers installed a mechanical plug approximately 50 feet into the drift. 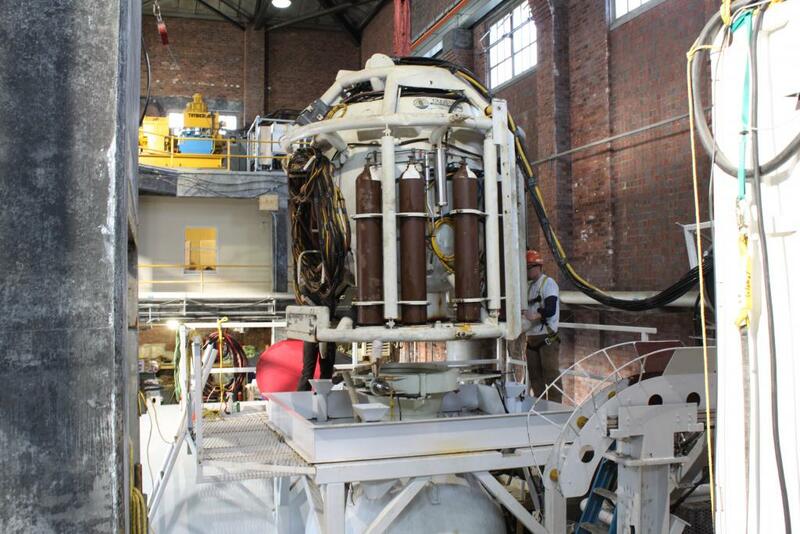 Highly specialized tooling and fixtures were developed for this stage of the project in order to assist the divers in the installation of the plug and its components. 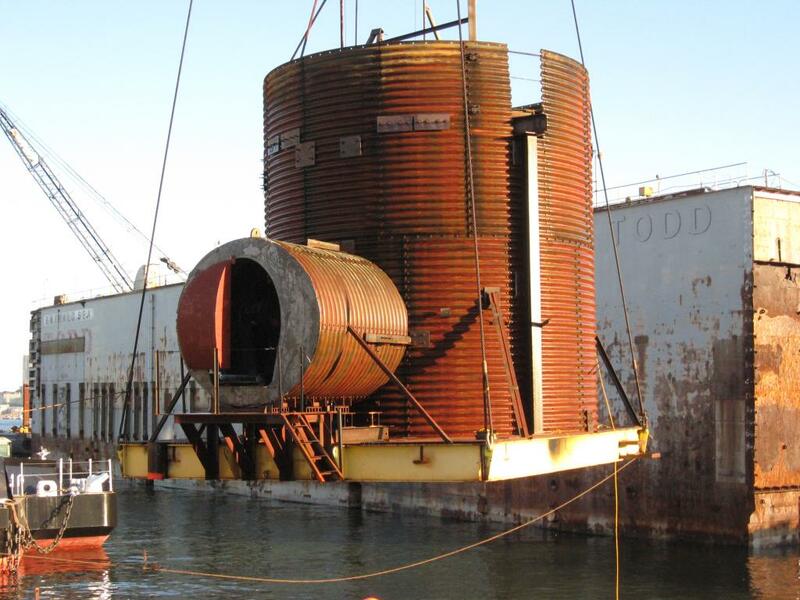 Divers were transported to and from the work site by an 8′ diameter diving bell. Given a shaft diameter of only 13′, all materials and tools had to be lowered prior to the bell being launched and had to be retrieved after the bell was recovered. 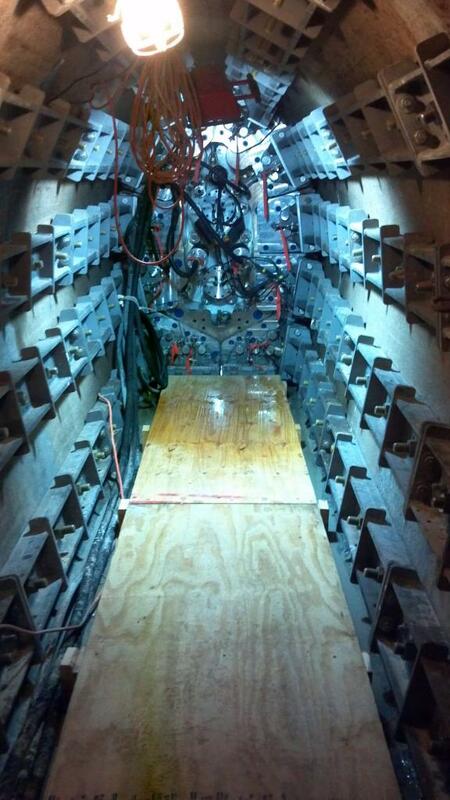 The 5′ x 7′ plug weighed over 23,000 pounds and was approximately four feet thick. It has a mechanical seal as well as two grout actuated seals to seal the perimeter. A series of struts were mechanically anchored into the drift walls around the perimeter of the bulkhead to withstand more than 2 million pounds of pressure. A detailed rigging plan was developed to allow for the loads to be lowered in the center of the shaft then pulled over to the side wall to allow room for the bell. A track system was installed along the floor of the drift to allow the divers to move the equipment and materials to the plug location. 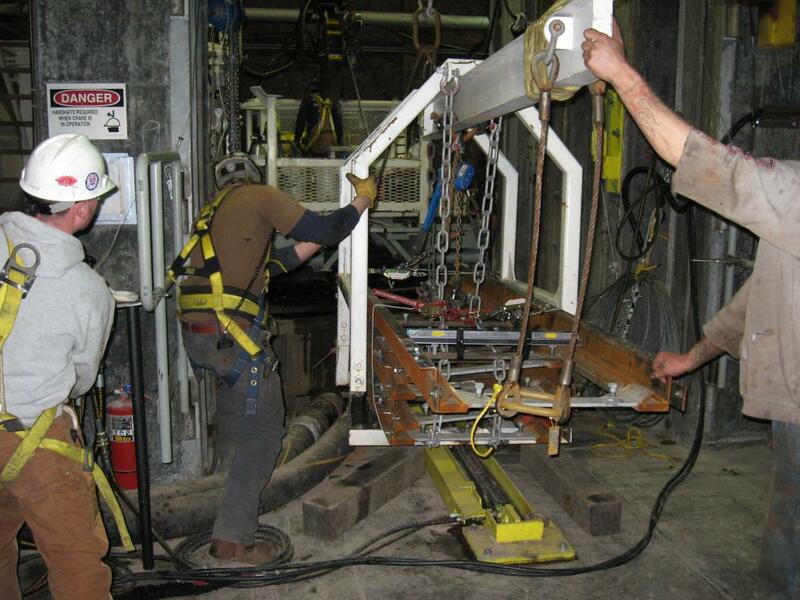 A remotely operated hydraulic crane was also designed and fabricated by Global specifically for this project. The crane, operated from the surface, assisted the diver in handling and installing the various pieces of the plug, some of which weighed up to 500 pounds.